On a dark, moonless night, the Orionids exhibit about 10 to 20 meteors per hour. These fast-moving meteors occasionally leave persistent trains and they sometimes produce bright fireballs. Orionid meteors fly each year between about October 2 to November 7. 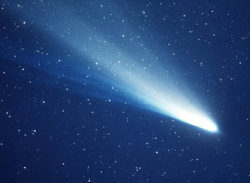 That’s when Earth is passing through the stream of debris left behind by Comet Halley, the parent comet of the Orionid shower. In 2018, on the peak morning, a bright waxing gibbous moon will set only shortly before twilight begins. You’ll have only a brief window for meteor-watching at the peak, maybe an hour or two. The Orionid meteor shower is expected to rain down its greatest number of meteors on the morning of October 21. On that night, a waxing gibbous moon will set only an hour or two before morning twilight begins. Try watching in the days before the peak when there will be less moonlight in the sky. Or plan to watch in the hours before dawn on October 21. Tip: Like for all meteor showers, try to go out in a wide, spacious area, away from any light, and give yourself plenty of time to adjust to the nightsky and for meteor peeping. Your best bet is to go outside at the suggested times, and plan to spend at least an hour, if not a whole night, reclining comfortably while looking up at the sky.